I find myself quietly whispering these words as I look down at my rescued kitty purring in my lap. 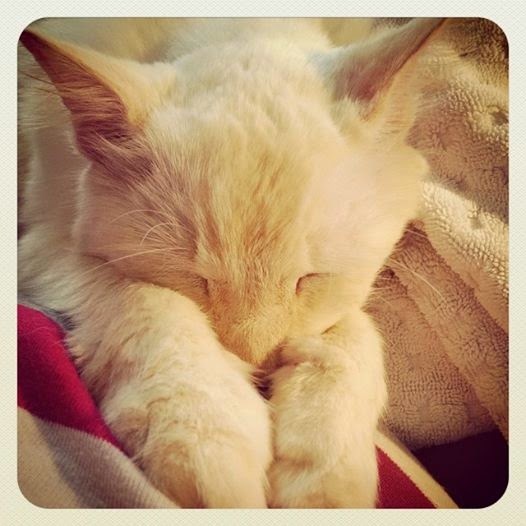 I stroke his cream-colored fur and hum softly to the once stray cat currently sleeping in my arms. Long ago, I dreamed this day would come. For this cat (now named Bailey) had been elusively hovering outside my home. Always too afraid or unwilling to let me bring him in. Always keeping his distance and space. Always wanting to trust me, but unable. Wanting to get close, but afraid. But last year around this time, all that changed when this sweet, big love bug walked right up to me and waited, as if with open arms, for me to pick him up and take him in. Yes, a once shy kitty boldly chose to approach me and ask for my love... and I joyfully, immediately, welcomed him home into our family. Isolating him inside our warm, snuggly home office (away from all our other fur-babies), I left a voice mail message with our beloved vet to schedule a check-up. Sadly, we found out he was covered in sores, and fleas, and scars, and past abuse. His vision - horrible. His eyes - a bit crossed. His joints - achy and arthritic, for he was no young kitten, you see. No, this was a mature senior citizen who once was neutered and promised much by another person. But clearly, heartbreakingly, at some point in time, he became lost, forgotten, left, abandoned. "Don't worry, you're mine now, baby. Don't fear, you're safe now, sweetheart. Just relax in my arms. Just listen to my breath." As I now ponder over Bailey's past life experiences, I pet his now-cleaned coat and begin to think of my Savior and those other "strays" still lost... those that He desires to bring into His home. How many cannot see Him? How many remain cross eyed in hopelessness from the sores, the irritants, the scars, the abuse of this world? How many are too afraid? How many are sooo heartbroken? How many are unwilling or unable to believe because they really do not know what I know about His grace? How many are out there living depressed and broken... feeling forgotten, put aside, and sterile from everyone and everything? If only they knew the true love of my Messiah. If only they would approach The One who would bring them inside, clean them up, heal their wounds, mend their sores, and call them by His New Name. Yes, Lord, I will tell them. I will share and give. Let me not overlook the least of these whom You lovingly see. Present me Your greatest honor and opportunity to obediently love others in Your Name. Use me as Your instrument, Your ambassador... to bring Your hope, truth, and peace to the world. Believers, won't you bravely join me in this prayer? Won't you lay down your life for His glory and cause? Won't you look beyond yourself and choose to love and be kind... despite all comfort, status quo, or logic? "Won't you be Mine?" He invites romantically, maternally, eternally. Yes, today, everything could change. Today, everything could be different. Jesus invites us all to seek, to know, to love in His New Way. He is ready, willing, and able to give each of us comfort, and rest, and hope, and home. Let us humbly come, and receive, and submit, and share. Don't you long to be closest to His heartbeat?